This week I am excited to share a recipe from a Certified Holistic Health and Supportive Chef, Laura Lea Bryant. A little about Laura per her website, it is my joy to help people recognize importance of self-care, especially amidst our daily stresses and pressures. We all work incredibly hard, yet we often forget why. We forget that we’re striving for harmony and balance, which is only achieved through first nourishing our bodies and minds. She features recipes that are Dairy Free, Vegan, Vegeatarian, Sugar Free and Dairy Free recipes. Hope you enjoy this recipe and when you have a moment explore her website, you won’t be disappointed. 1) In a large sauté pan on medium heat, sauté the grated tempeh in three tablespoons olive oil until golden brown around the edges. Add remaining olive oil and diced onion, plus 1 teaspoon salt. Cook until onions are soft and translucent. 2) Add garlic, oregano, basil, and onion powder and cook for another 3-4 minutes. Add red wine and reduce until almost all liquid has evaporated. 3) Add tomato puree, paste and molasses and stir. Cook covered for 15-20 minutes. 4) While sauce simmering, cook brown rice pasta to al dente. Drain and reserve ½ cup cooking liquid. 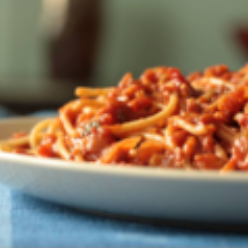 5) When sauce Bolognese is ready, add pasta and use cooking liquid to thin out, if necessary. Season with salt and pepper to taste and serve. Hope you enjoy the recipe and feel free to share the page with friends.